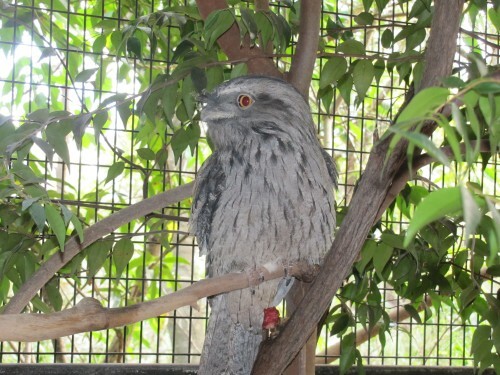 On our recent visit to the Australian Wildlife Park near Gosford north of Sydney, I was pleased that a part of their collection of animals included birds. In fact, some of the birds were in walk-through aviaries. Such cages are good opportunities to get good photos of species it would be hard to obtain with animals in the wild. 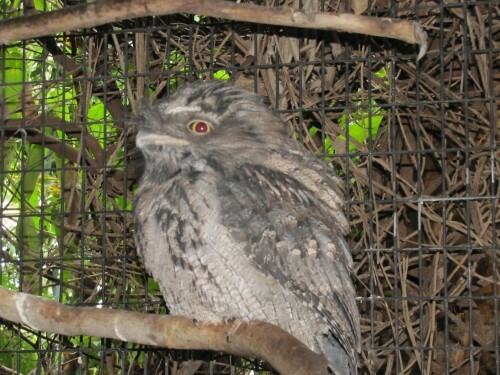 One of the aviaries featured owls and frogmouths. I’ll show the owls in another post in a few days’ time. Tawny Frogmouths, as shown in today’s post (above and below) are one of my favourite birds. Ever since a family Easter camp in the 1986 at Hattah-Kulkyne National Park in north-west Victoria we have loved these birds. On that occasion one decided to roost on a branch above our tent and call for quite a while during the night. Once we worked out what it was, the constant oom-oom-oom call soothingly put us to sleep. We have occasionally heard and seen this species in our garden at home in Murray Bridge, South Australia. Because of its soft call we do not hear it if the television is going in the evening. Perhaps that is a good reason for occasionally switching it off.